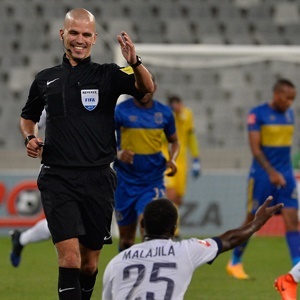 Cape Town - South Africa referee Victor Gomes has been tasked with officiating the crunch CAF Champions League semifinal encounter between Al Ahly SC and Etoile Sportive du Sahel set to be played at the Alexandria-Borg El Arab Stadium in Egypt on Sunday, October 22. According to the official SAFA website, Gomes’ appointment comes at the back of a number of solid officiating at recent CAF competitions. The 34-year-old whistle blower will be accompanied by Lindikhaya Bolo and Sello Moshidi as his assistant referees who are both not new to such occasions having officiated in a number of CAF Cup competitions. "Such call ups are not to be taken lightly as it shows the trust bestowed upon the Association," said SAFA technical committee chairperson Natasha Tsichlas. "We are continuously hard at work in developing quality referees who can represent us to the world. We wish the three referees the best of luck in Egypt." Meanwhile, SAFA football general manager Russell Paul has also been assigned to the same match as the General Coordinator. Paul’s assignment is not new to him having held such positions in a number of FIFA and CAF competitions in recent years.